If I told you that I had found one product that could replace my counter spray, my sink cleaner, my floor cleaner, my degreaser for my stovetop, my window and mirror cleaner and more, would you believe me? How about if I told you that one bottle can last for well over a year, and that it costs pennies compared to other cleaners? Okay then, as a kicker I will throw in the fact that it is completely green, non-toxic, biodegradable, and safe for your whole house, kids, pets and all. Oh, and it really works. Works well! Remember that I was slowly working my way through that Shaklee order that I had gotten? Remember my experience cleaning my oven? I completely fell in love with Shaklee's Scour Off that night. And then I found another product in their arsenal that, if not being even better than the Scour Off, at least matches it as my favorite product. It's called Basic H, and I love it! Admittedly, I am easily impressed. But seriously, this stuff is fantastic! 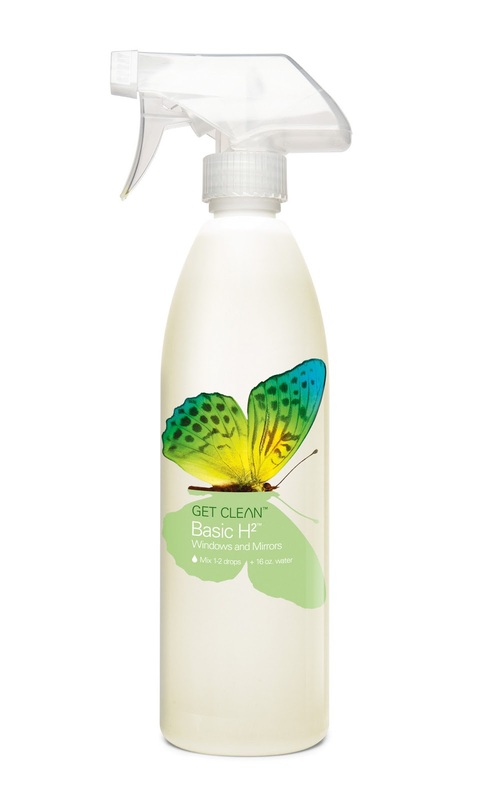 One bottle of Basic H is so concentrated that it makes 48 GALLONS of nontoxic, biodegradable, completely natural All Purpose Cleaner! Do you know what I would have to spend to get 48 gallons of Seventh Generation All Purpose Cleaner? Over $950.00, that's how much! But I get my 48 gallons of Shaklee All Purpose Cleaner in a 16 oz bottle that only costs me $10.35. I just mix it in a spray bottle, 1/4 teaspoon of Basic H with 16 oz of water, and I'm good to go. Or if I need a little extra oomph in my cleaning, for the stovetop or microwave or sticky messes, I mix 1 1/2 teaspoons Basic H with my 16 oz of water for a bottle of degreaser. And the stuff works! When you finish cringing come back to me. It gets better, I promise. A thing of beauty, that's what. Maybe ignore my paper towel lint that is left over. It was shortly after this shot that I learned to use microfiber. But here is another example. Remember when Nugget was kind enough to decorate the couch with a red sharpie? I read that Basic H was great for getting that kind of thing out too, so I went for it. What kind of grown person marks up her couch cushions with Sharpie to test her new cleaners? Me. I do that. See? Pretty amazing for one pass with the stuff! I am going to do it one more time to get out that lingering purple cast. I'll keep you posted. And floors! My poor wood floors see all manner of junk on them. Dust, mud, grass, drippy kid snacks, crumbly everyone snacks, kid feet, dog feet, cat feet, dog food, cat food, and fur of all kinds and descriptions. And more, I'm sure, but we're just going to stop there. I used to use my Swiffer Wet Jet on them, but it was just too streaky. And smelly. So I switched to Bona, and it was fine, but expensive! And these floors need to be cleaned easily a couple times a week, if not more. Take a look at this picture of my entry floor. Ignore all the junk around. Look at all those little paw prints! And slobber marks! Ewww. Let's move on! Phew! No streaks. No smell. Just clean. Natural, nontoxic clean. Love it. Here are some before and afters of other parts of my floor. Don't judge! And the area where the cat eats. Which is gross. Just warning. And it's just a matter of spray and mop up with a microfiber pad. Seriously, all of these floors took me less than five minutes. Love that! Now when my kids insist on eating that piece of whatever that they dropped on the floor, I don't cringe thinking of the leftover chemically junk they are putting in their mouths. This stuff really is great. I can do windows with it. I can clean stainless with it. I can clean my granite counters with it. Actually, I can clean pretty much anything with it. And I plan to! Do you have a cleaner that you love? Or do you use Shaklee and have a favorite product from them? Let's hear it! Want to know more about Shaklee's products, and how changing brands can change your life? CLICK HERE TO TRY IT FOR YOURSELF!